Suffocating from a feeling of impending failure I drew in a deep breath, exhaling slowly. Relax, I murmured. 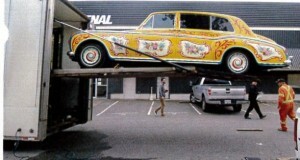 I’m just responsible for moving a car from our collection for exhibit in Montreal with a few complicating factors: the car is a vintage Rolls Royce, once owned and driven in by Beatles legend John Lennon; the entire body forms a metal “canvas” for an original oil painting; it’s 2700 kg weight precludes it moving without functioning brakes – these only operate with the motor running; the car needs engine and other mechanical work; in addition our conservation team discovered flaking surface paint AND we have less than five weeks before the Rolls must be at the borrowing museum. The start date was non-negotiable. Okay, let’s do this I thought optimistically. I shot a call to our Rolls mechanic, mustered one of our conservation interns, who coincidentally specialized in painted metal. Parts were ordered and the restoration of the cars surface began. 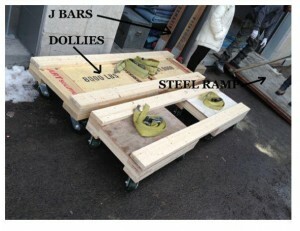 Now for the transport plan: initially, it literally involved thinking “inside the box”. We decided to crate the car, move it on an extra heavy duty, brake-equipped dolly and minimize ground transport risk by flying the vehicle to Montreal. Good plan? No. The proposed crate size would only fit on an “air freighter”; the closest service was Seattle. This meant transporting the crate off the island, where Victoria is located, crossing the border into the US and flying the car back into Canada – a logistical and bureaucratic nightmare. 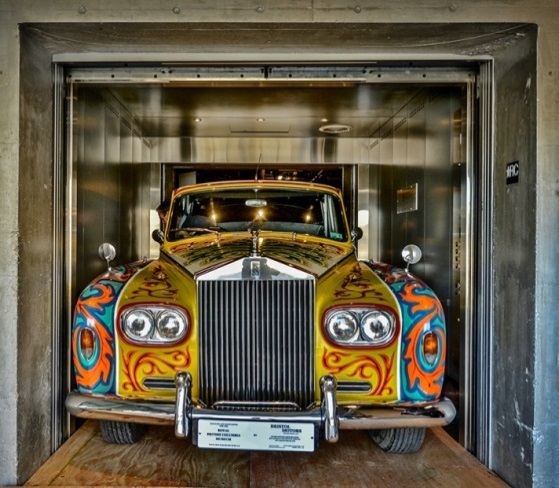 In addition, a second scan of the borrower’s Facility Report revealed that the crated vehicle would exceed the size of their largest receiving door. Feeling more than just a bit unsettled I called our Rolls mechanic to ask for his advice. He suggested contracting a ground transport firm specializing in moving ultra-luxury and multi-million dollar race cars. I madly researched, found and booked such a carrier. A couple of weeks sped by, organizing logistics, loan agreements, insurance. The pickup date was now one week away. Conservation work was progressing well; the worst areas were stabilized but lack of time prohibited completing the work. We had counted on this since the only climate controlled vehicle in the transport fleet had been booked six months beforehand. A frantic call went out to our national conservation institute asking how this type of paint on metal might react to the rapid variations in temperature and relative humidity which the truck and cargo would encounter on the cross-country trek. Weather wise there couldn’t have been a worse month to transport in Canada. The Canadian Conservation Institute responded rapidly indicating the unusual paint formula was ordinarily applied only to wood. However, their final determination, though not definitive, indicated the paint should hold up under these conditions. There was a collective sigh of relief, tempered with unease. I phoned our mechanic. The parts were to arrive Thursday. Thursday? The transport truck would be here early the following Tuesday morning. Can you fix the car in time, I asked hopefully? Shouldn’t be a problem was the response – another hesitant sign of relief. Tuesday morning arrived. The parts had come, the repairs made, the car tested and ready for loading. The transport truck pulled in and lowered its lift gate. 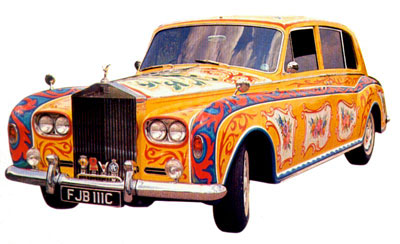 The driver stepped down from his cab, eyed the Rolls, looked quizzical and said: how long is this vehicle’s wheel-base again? All eyes turned and collectively the entire teams’ hearts stopped momentarily and this horrifying thought crept into everyone mind simultaneously: the Rolls is too long for the lift gate. Tape measures appeared and measurements taken. The result, the car should just fit. Our mechanic stepped into the Rolls and confidently but carefully edged the car forward into position. It worked. The tires were blocked the vehicle lifted, then driven on board and secured at the wheels. The driver locked the cargo door, sprung into his cab and the cross-country journey began. We maintained regular communication with the driver who reported good conditions until near the end of his journey when the weather forecast threatened the onset of a huge weather system, with high winds and snow predicted to sweep down from the NW on an interception path with his vehicle. The driver recommended pushing on to out run the storm. It was this, or wait out the storm and miss the delivery deadline. Assured he had recently rested we gave the go ahead. On March 4th, late in the afternoon, 8 hours behind schedule he maneuvered his cumbersome vehicle through the constricted downtown streets of Montreal. Beforehand Montreal police were summoned to secure the area; block off critical streets and do crowd control and museum staff gathered in anticipation of the trucks arrival. 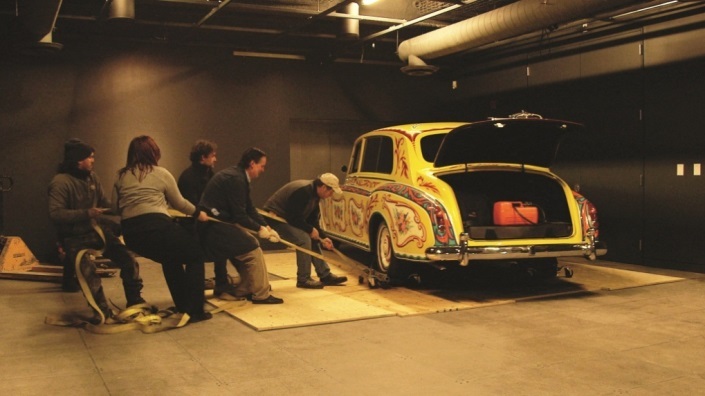 The staff, equipped with beautiful high load bearing dollies had anticipated the need to push the Rolls from the truck, along the street, and up the steel ramp into the museum. Our Rolls mechanic and head objects conservation, who flew out earlier, explained that hand pushing would damage the body and only one method could be used: driving the vehicle into place. The road was wet and salted, creating the need to cover the path before moving the vehicle. Blankets, plastic, foam packing material was scavenged from the truck and museum but the quantity was insufficient. In desperation someone began “excavating” in a nearby dumpster and discover a huge roll of orange plastic, more than sufficient to do the job. Once in place our mechanic cautiously started the car, backed it out and off of the truck, then maneuvered it down the street to the museum entrance. 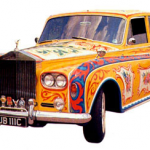 Then another heart stopping moment – the Rolls looked too large for the entrance. 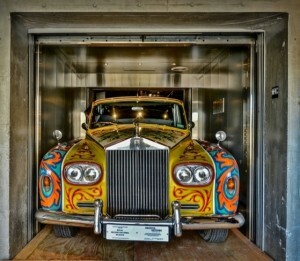 But we knew the entrance size in advance and we used the dimensions of the car provided in the catalogue description. People with tape measures swung into action. With a self-satisfied grin one staff member turned and proclaimed that we had a whole 10 cms of clearance on either side of the car. Some say collections managers are obsessive about accuracy when documenting the size and details related to collections objects. Thank goodness this statement proved true. The next challenge for our mechanic was to finesse the large vehicle through the extremely tight space. It proved a challenging few minutes with people shouting instructions and tensions rising but the vehicle moved unscathed into the exhibit hall. Maneuvering the car rapidly into its exhibit position onto reinforced plates became the next urgent task. Most of the floating floor tiles supported a maximum of 567 kgs while the load on the individual Roll’s tires was 680 kgs each. Almost immediately after the car entered the hall the regular floor tiles showed initial signs of buckling. The car threatened the possibly collapse of the floor. The museum staff flooded down to the carpentry shop returning with sheets of plywood. Hastily the Rolls was driven onto them thereby safely distributing the weight, eliminating the hazard. 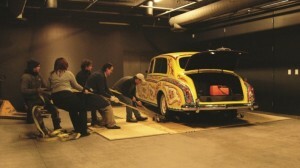 Now, how can the car be moved into place? A creative solution coupling technology and brute force was concocted. GoJacks with racket straps attached were placed under each wheel. The team then manually pulled the car over the plywood sheeting and into position adjacent to the reinforced tiles. The Rolls mechanic quickly but accurately drove the car so all four tires rested on the target tiles. It was in position. Yes! Now concern turned to the condition of the painted surface. How serious was the impact of the volatile and dramatic temperature and RH changes? A local paintings conservator, on hand to do the incoming condition report examined the surface carefully and found the paint undamaged. We did it. We made the target date. 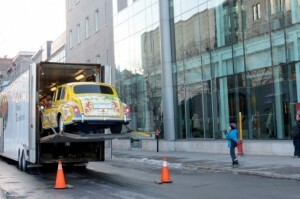 The car was in place 24 hours before the special opening for the province of Quebec’s two most powerful politicians: the Premier and the Lieutenant Governor. All of the hard work and planning, backed by brilliantly accurate cataloguing, tempered with innovative problem solving led to the success of this project. This is my last article for RegTrek. I want to thank the RegTrek team for their hard work and support and especially Angela Kipp for her energy and enthusiasm in spearheading this brilliant project. I want to wish everyone a fond fairwell as I transition to a new career: teaching English as a Second Language, and ESL material and curriculum development. I wish everyone the best in moving this amazing venture, RegTrek, forward, and I thank you for allowing me to participate. Derek Swallow, Senior Registrar, Royal BC Museum. That was an incredible story, thank you! Great telling of a fascinating story – thanks for sharing Derek. If the ESL career doesn’t work out you could consider being an author. Wow, Derek, what a story! No wonder you’re taking another job. Makes our upcoming need to move a small covered wagon look like a mere trifle. Best of luck in your new career.